Suffice it to say there are a lot of cat-lovers in the United States and beyond, and suffice it to say, those millions are asking: doesn’t their little tabby act just like that cat in the show? “Cats” is at the North Shore Music Theatre through Sunday (Sept. 1) and while it is still short on story, it is still long on spectacle and dance. Sir Andrew Lloyd Webber’s paean to felines, based on the poems by T.S. Eliot, ran 18 years on Broadway — far beyond the lifetime of a normal cat — and has lived on since in regional productions and tours. It has always been a true ensemble piece, with everyone in the cast getting his or her turn at bat dancing or singing a cat with a particular personality trait: Rum Tug Tugger (Kevin Loreque), better known as the Elvis Cat; the magical Mr. Mistoffellees ( Ryan Koss ) or the sinister black cat Macavity (Joe Moeller). In their singing and dancing, they have a chance to put forth that character. The scenic elements have had to be scaled back a bit — the junkyard set on Broadway that rose to the sky isn’t quite as grand , and the tire that carries Grizabella up to the Heavyside Layer has also been scaled back to the confines of the stage. But the other elements are all here — the costumes, lights, music and some dazzling choreography by director/choreographer Richard Stafford, a veteran of several successful NSMT shows who also was involved in the very beginnings of the show. He knows how to stage a production number in the round. NSMT owner Bill Hanney has co-produced “Cats” with his Theatre by the Sea that he also owns in Matnuck. R.I. Whether you consider “Cats” great theater may depend on whether you are intimately acquainted with Friskies and Fancy Feast. At the very least, it is a family-friendly and a great way to introduce your kids to theater — like I did. 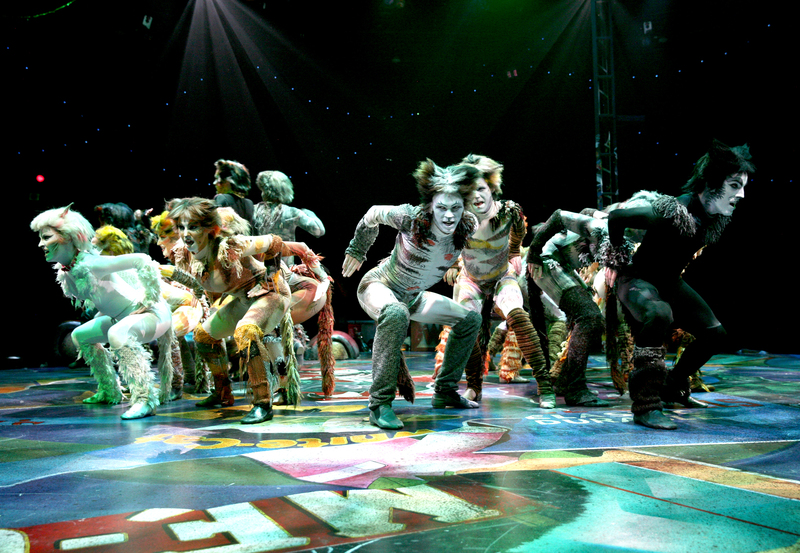 The North Shore Music Theatre production of “Cats.” Music by Andrew Lloyd Webber. Lyrics and book based on “Old Possum’s Book of Practical Cats” by T.S. Eliot. Directed and choreographed by Richard Stafford, with Jonathan Stahl assistant director and choreographer. Musical direction by Milton Granger. Through Sept. 1. http://www.nsmt.org.